Analysis Sets are a way to change what columns are showing on the lab analysis table based on your current use case. Changing to another analysis set on the lab analysis table does not filter the results you can see, it just changes the columns of the tables so you only need to see what you are working with. Vinsight comes pre loaded with a few common analysis sets, Ferment Chart, Finished Wine and Maturity Monitoring. Each has a different set of columns defined which are useful for their context. If you find that one of these sets is very close to what you need, but is maybe just missing a column that you need to keep track of, you can simply edit the analysis set to add, re order or remove columns. To edit an analysis set, you will need to go to Analysis Sets in the Settings > Analyze area. Here you will see a list of the current analysis sets. Simply click one to edit. In this example we are going to edit the Maturity Monitoring analysis set to add a Baume column. 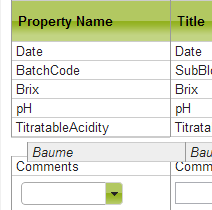 Then if you want, you can change the title to give the column a different display name in the Lab Analysis table. To adjust which data is displayed on graphs simply go to the ‘Show On Graph’ column, set the properties you wish to display to ‘true’ and all others to ‘false’. IMPORTANT: Your analysis set must have at the Date and BatchCode columns as a minimum. If they are deleted the Lab Analysis table may not work correctly. When you have finished editing, simply press “Save” and you’re done.